Monarch Air Group provides private air charter in Amsterdam, Netherlands. Our clients benefit from top-notch service, unrelenting dedication to safety, wide selection of aircraft, and years of experience in chartering private jets. To obtain a free quote, please use our online quoting tool provided below, or call toll free 1-877-281-3051. Monarch Air Group provides private jet charter services to and from Amsterdam, Netherlands. Amsterdam is the capital and largest city of the Netherlands situated in the western part of the country. Amsterdam was founded as a small fishing village in the 13th century and developed as one of the most powerful trade centers in the world by 17th century. 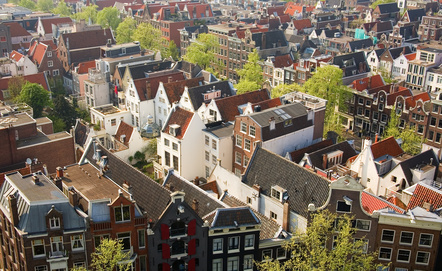 With its chief port, Amsterdam is the center of the country’s largest metropolitan area. It’s also the center of the financial, commercial, industrial, and cultural activities. The city’s economy is based on the banking, tourism, media, minerals, chemical, automobile, electronics, shipping, horticulture, service industry, and clothing. Being one of the great commercial centers of Europe, the city of Amsterdam has one of the world’s oldest stock exchanges and is well known as a main center for the diamond-cutting industry. Amsterdam is home to the headquarters of several large international companies, including Philips, Royal Bank of Scotland, Heineken, Fonterra, DotNetNuke, Teleplan, ING Group, and AkzoNobel. It’s the cultural capital of the Netherlands with a wide range of cultural, recreational, historical and architectural sights, including famous art collections, beautiful museums, charming canals and famous festivals and events. The most popular tourist attractions include Van Gogh Museum, the Rijksmuseum, Stedelijk Museum, Oude Kerk, Anne Frank’s House, Amsterdam Historical Museum, Royal Palace, Magere Brug, Begijnhof, Jordaan, Leidseplein, Rembrandtplein, Heineken brewery, and Red Light District. There are also the beautiful canals that are a symbol of the city of Amsterdam. Throughout the year Amsterdam hosts many events and festivals including the International Documentary Film Festival, Holland Festival, World Press Photo Contest, Amsterdam International Fashion Week and Queen’s Day, along with Art Amsterdam. With its rich historical and cultural heritage, friendly atmosphere and ethnically diverse population, Amsterdam attracts about 3.5 million visitors every year. The city is served by Amsterdam Airport Schiphol (AMS), Soesterberg Airport (UTC) and Valkenburg Airport (LID).